These Chocolate Peanut Clusters have only 4 ingredients and are so easy to make! Just throw everything in the Crock Pot or slow cooker and you’re done. Who doesn’t love chocolate combined with crunchy, salty peanuts? 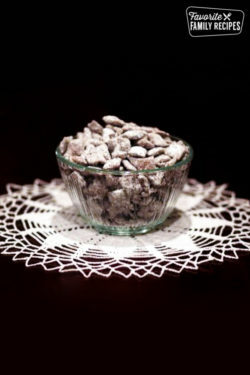 These Easy Crock Pot Peanut Clusters will delight anyone on your Christmas list! 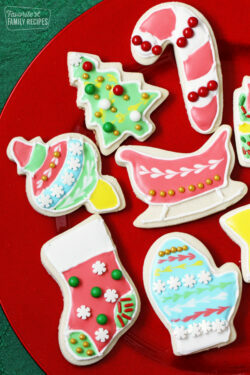 These make a great treat to pass around to friends and neighbors at Christmas time. 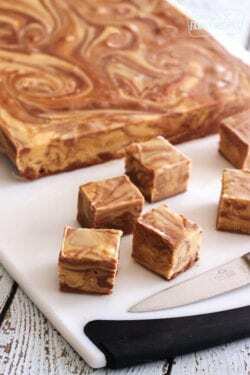 They have a creamy, gourmet taste and your friends will think you put a lot more work into them than you actually did (which is totally my kind of treat). You can refrigerate these in an air-tight container or even freeze them. I like them best at room temperature because they are more soft and creamy. This is a recipe from my FABULOUS mother-in-law. Every time she makes these she gets rave reviews. I honestly can’t believe it has taken me this long to get the recipe on here. It’s definitely a family favorite! If you aren’t a fan of peanuts, don’t worry. These beautiful, festive treats can be made with almonds or cashew in place – or in addition to — peanuts. And while we’re branching out, consider walnuts, pecans, macadamia nuts… the possibilities are endless. For those who love the flavor of fruit in their chocolate, add some dried cherries, Craisins, raisins or other dried fruit to the mix. And if you added marshmallows… well I think you can see what Rocky Road we’re heading down. 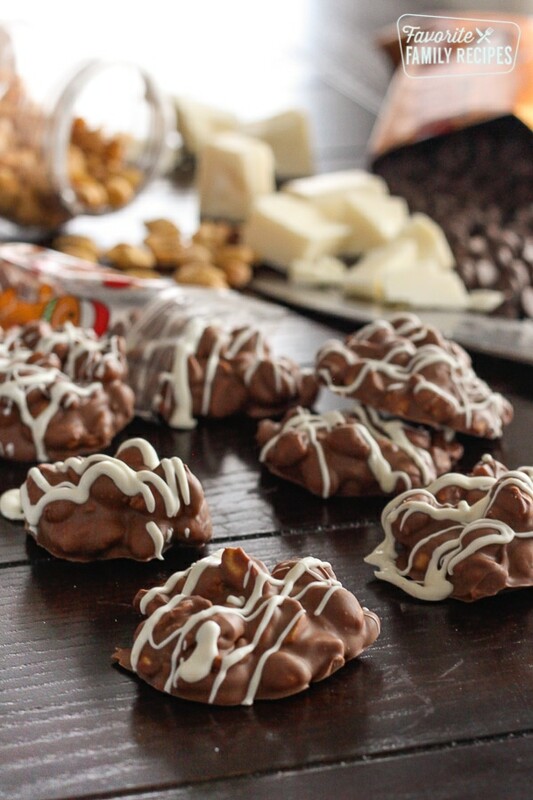 These Chocolate Peanut Clusters have only 4 ingredients and are so easy to make! Just throw everything in the Crock Pot or slow cooker and you're done. Combine all ingredients in a large crock pot on LOW heat for 1 hour, stirring once half-way through. Using a spoon, scoop clumps of peanut mixture on to wax paper and allow to cool to room temperature. You may refrigerate or freeze them. Be sure to serve at room temperature for the best texture. If you want to make a decorative topping (like in the picture) just melt some white chocolate chips or vanilla melts and drizzle over the top! Slow Cooker Molten Chocolate Cake — Warm and gooey, this is a chocolate lover’s dream! Could you switch out the nuts (for like pecans or walnuts)? YES! My boss made these with cashews added. YUM! I just use the plain White Chocolate Dipping Bark (cubes). Can you use a bit of baking wax to harden the chocolate instead of the almond bark? We have never tried it that way.. if you try it let us know how it turns out! Today I tied this recipe using about a 1/4 of a block of Gulf Wax instead of the almond bark and it turned out great! I love this recipe. It’s a huge hit with my family. Thank you so much. My slow cooker tends to run a little hot, and I am worried about this mixture burning or seizing up. Could this be made in a double boiler or a microwave instead? 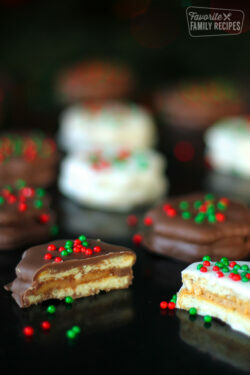 I’m making this right now for a cookie/candy exchange tomorrow. Super excited because this looks amazing!! Is there a dark chocolate variation for this? Of course, you can use dark chocolate chips instead of the semi-sweet and that should do it! If you want it REALLY dark you can use dark chocolate bark as well. Can you use chocolate melts instead of chocolate chips? These are awesome. Can someone tell me how to freeze them please? Can this be done with dried cherries and almonds? Absolutely! Dried cherries and almonds will be delicious! I have made this once already and LOVED it. Question: can I double this recipe? Absolutely! You just need a crock pot that is big enough to hold it all. Hope this helps! could mini marsmellows also be added? Yes, but stir them in just before you make the clusters so they don’t melt. Great idea! I’ve never used CandiQuik, but it is advertised as a candy coating like almond bark so I think it should work just fine. Thanks for asking!